We've gotten our computer back from the shop, and I've got lots of yummy stuff to share tonight, Project Runway permitting! I made this for The Kid and his best friend, who comes to visit a couple nights a week while his mommy goes to class. Usually the two of them are pasta hounds, picking out noodles to eat, while ignoring all kinds of lovely meats and vegetables. (Sigh.) This time, they both surprised me by picking out the meatballs and having to be coaxed to eat the pasta and tomato sauce. I'll take that as a success! 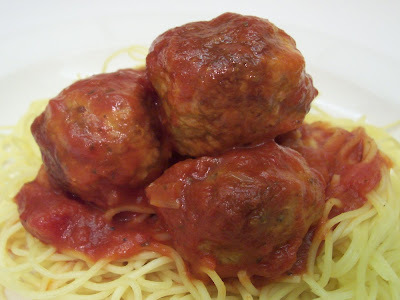 While the meatballs are browning, heat the olive oil in a heavy bottomed pot and cook the onion until translucent. Stir in the rest of the seasonings, then the canned tomatoes. I used this mixture of crushed tomatoes and tomato sauce because that's what was in my cupboard, but use whatever kind of squished tomato you prefer. Once the meatballs are brown on all sides, gently transfer them to the pot of sauce, and allow them to simmer on low for twenty to thirty minutes. Serve over egg and dairy free angelhair pasta. Makes about two dozen meatballs. Update: You may also enjoy Swedish Turkey Balls. these sound delicous! So in Belgium it is near impossible to find things like flaxseed meal, so could I just leave it out? Instead of leaving it out, I would substitute a safe breadcrumb to act as a binder. The advantages of the ground flax seed is that not only is it nutritious and a really excellent binder, it helps the ground turkey become nice and brown. (Turkey can be a little grayish.) You might be able to find the flax there, though, since I do remember seeing Leinsamenbrot (flax seed bread) when I lived in Germany. I have recently found your blog and love all of your recipes. My son also has several severe food allergies. So your recipes are very helpful! I was wondering what kind of allergy friendly bread you use in your meatballs (and in general?!) Thanks! I usually use Publix store brand whole wheat bread, which may not be available in your area. I've also used some of the Arnold's varieties on occasion, but since some of their products have unsafe ingredients, I'm not entirely comfortable with the brand. Thanks so much for the kind words about the recipes. Good luck with your son! Hi, I will be trying this recipe for dinner tomorrow...Since I can't use Gluten in the recipe, could I replace them with more flaxseed meal?? If not, what else could I use in place of the breadcrumbs? Thanks! Sorry I'm late answering for your dinner, but you could just stick with the flax seed, which would give you a slightly denser texture to the meatball. If you want a lighter texture, you can crush up some gf cereal, like Rice Crispies or Chex to to sub for the breadcrumbs. Hope you enjoyed your meatballs!